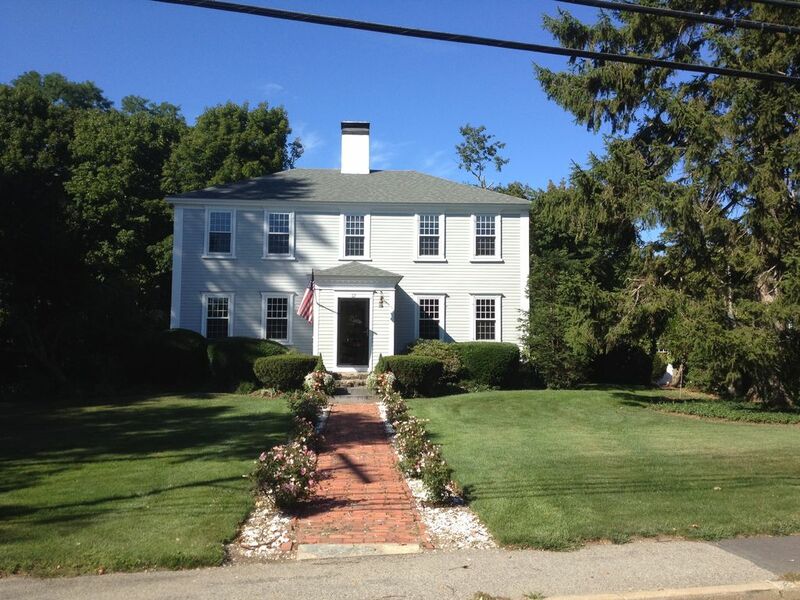 Restored and updated 220-year-old antique located in the heart of the seaside community of Duxbury, MA. Imagine following the steps of ship captains and their families who have had the privilege to call this home. An original post and beam construction built when George Washington was president, this home features 4 fireplaces, 3 wood stoves, wide pine plank floors, original plaster walls, ceilings, moldings, and two staircases, one of which reflects the shipbuilders' heritage by being as much ladder as stair. The living room has a working fireplace, unique plaster crown molding, baby grand piano and full entertainment center complete with surround-sound. The .92 acre property has mature plantings, a 100' x 60' private, level side yard that's perfect for all kinds of gameplay, and is bordered by a spectacular perennial garden. The Play Room, a semi-attached 15’ X 32’ newer cathedral ceiling structure, is complete with 8’ Olhausen pool table, home theater center with 65” Samsung 4K curved widescreen, 5:1 surround sound, and oversized leather furniture. The 16’ X 34’ kitchen has a wood stove, seating area, and employs a gas stove, electric convection oven, microwave, trash compactor, sink disposal, stainless fridge, dishwasher, white cabinets topped with thick granite tops resting on a rich, redwood floor. The 40’ X 16’ raised slate patio is private, gets full time sun and is the location of the Weber Genesis gas grill. When it gets too hot move to the 16’ x 16’ screened porch, secluded by plantings, which is cooled by shade and ceiling fan, and is a favorite place for al-fresco dining. The second story master bath and the full hall-bath feature heated tile floors for barefoot comfort and updated fixtures. The home is warmed with forced hot air and cooled by your choice of central air or whole house fan. Access to the bay is a small landing that's directly across the street, and shopping/restaurants, including a supermarket, is just a 5-minute walk. Snug Harbor, Duxbury’s boating center, is a 24 min walk/5min drive down Washington St and is home to Duxbury Yacht Club, Duxbury Maritime Sailing School, Duxbury Oyster farms, charter fishing, and perhaps the finest french-bakery this side of the Seine River. This is a bike friendly location with easy flat riding among historic homes on a tree lined drive following the waterfront. Shipyard beach is a 10 minute walk and Duxbury Beach is a 10 minute 3.4 mile drive accessed by a picturesque wooden bridge, offering sand, dunes, marine-life and great fishing. Plymouth- (9 miles) home to Pilgrims and the ‘Rock’, has scores of fun to see sites, including whale watching, Provincetown ferries, lobster fishing tour, jetski rentals and many great restaurants. Cape Cod is 22 miles south. Boston-Logan Airport is 35 miles north. Access to the bay is directly across the street, Shopping/restaurants, supermarket, is just a short 5 minute walk. Snug Harbor-Duxbury’s boating center, is 3 min drive and is home to Duxbury Yacht Club, Duxbury Maritime Sailing School, Duxbury Oyster farms, and Charter fishing. Duxbury Beach is a 10 minute 3.4 mile drive through the most picturesque part of town and is reached by crossing the nation’s longest wooden bridge, offering sand, dunes, marine-life and great fishing. Plymouth- (9 miles) home to Pilgrims and the ‘Rock’, has scores of fun to see sites, including whale watching, Provincetown ferries, lobster fishing tour, jetski rentals and many great restaurants. Kingsbury Spa 3.1 miles Cape Cod Canal is 22 miles south. Boston-Logan Airport is 35 miles north.